About 5,000 students are scheduled to earn their degrees this spring during commencement ceremonies Thursday-Saturday, May 14-16, at College Park Center. 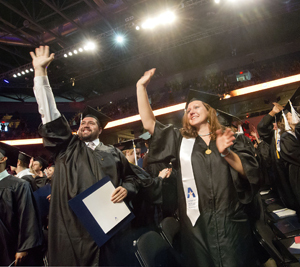 The UT Arlington Class of 2015 includes more than 3,500 undergraduates and nearly 1,400 master’s students. More than 100 students will receive doctoral degrees during commencement weekend. Read more about spring commencement. See the full schedule of commencement week activities. 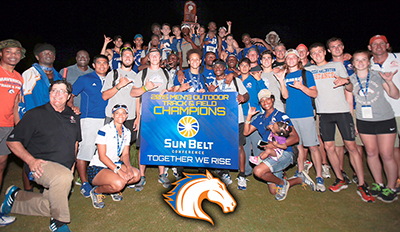 The men’s track and field team repeated as Sun Belt Conference champions after turning in a stellar performance Sunday in Gulf Shores, Ala. The men's conference outdoor title is UTA's 10th all time and the fifth under coach John Sauerhage. The Mavericks finished with 166 points to post an 18-point victory over second-place Arkansas State. The women’s team improved upon last year's finish by two spots, claiming fourth. Senior sprinter Clayton Vaughn registered the most impressive performance of the day, clocking a winning time of 9.93 in the 100 meters. The time shattered his own school record (10.07) and established a new meet record. It ranks as the third-fastest time in the NCAA this year. Read more about the men’s SBC track championship. 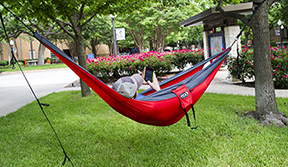 Lightweight hammocks pop up around campus in the best shady spots. Students use the portable loungers for studying and snoozing. Help during final exams—whether with a course-specific topic or with study stress—is available across campus. Find study help at college-based clinics and labs such as the Math Clinic and the Writing Center. The Maverick Resource Hotline is at 817-272-6107 and resources@uta.edu. The Central Library will remain open continuously through 8 p.m. Friday, May 15. Other UTA libraries will maintain regular hours during finals. The University Center is open continuously for finals through 11 p.m. Wednesday, May 13. UT Arlington Libraries will serve free coffee at all three libraries before finals. The java is first come, first served, until the coffee runs out. At the Central Library, coffee is ready at 10 p.m., midnight, and 2 a.m. Tuesday-Thursday, May 12-14, on the first floor. Grab a cup four hours before closing time at the Architecture and Fine Arts Library through Thursday, May 14, and the Science and Engineering Library through Thursday, May 14. Students, faculty, and staff are invited to attend the Office of Emergency Management's annual Clery Act tabletop exercise. The event is 2:15-3 p.m. Thursday, May 21, in the Hospitality Suite at College Park Center. The exercise will focus on a discussion over emergency notification, shelter-in-place process, and evacuation on a campus-wide scale. Key officials, internal and external, will participate in the discussion. Several job openings on campus for 2015-16 are listed on SnapJobs. For more details and to apply, go to UTA's Snap Jobs site. Regular registration ends for summer intersession and 14-week term. First day of classes for summer intersession and 14-week term. Late registration for summer intersession. Deadline to submit meningitis vaccination documentation for summer intersession and 14-week term. Late registration for summer 14-week term. University closed for Memorial Day holiday. Last day to drop classes for summer intersession. Final exams are scheduled through Friday, May 15. See the full final exam schedule online. Detailed instructions on how to claim your graduate and guest tickets were sent to your UT Arlington email. Summer intersession and the new summer 14-week session in the College of Nursing begin Wednesday, May 20. Class dates are online. To register for summer intersession and the summer 14-week term, click on the Additional Search Criteria link on the schedule of classes page. All new students and those who were not enrolled in the spring term will not be able to register for summer sessions until they file proof of meningitis vaccination. Prerequisite checking will be enforced in MyMav when grades are final for the spring semester. If you are enrolled for summer and do not successfully complete the prerequisite in the spring term, you will be dropped from the next-level course when spring grades are posted. If you are enrolled for fall but not summer, prerequisite completion will be checked when summer grades are final in August. Prerequisites not only include courses that must be taken in sequence, but also some restricted to class level, GPA, or concurrent enrollment. Check Class Details in the MyMav Schedule of Classes. Questions regarding prerequisites should be directed to your academic adviser. A list of advising offices is online. Commencement The Class of 2015 graduates. Tickets required. Thursday, May 14, 7 p.m., College of Nursing and Health Innovation. Friday, May 15; 11 a.m., School of Urban and Public Affairs/School of Social Work/University College/School of Architecture; 3 p.m., College of Science; 7 p.m., College of Liberal Arts. Saturday, May 16, 11 a.m., College of Business; 3 p.m., College of Engineering; 7 p.m., College of Education. All at College Park Center. Commencement. Mejia Ballet Under the direction of Paul Mejia, master teacher and choreographer, the company’s spring repertoire will feature Romeo and Juliet, Brahms’ Waltzes, Sylvia Pas de Deux, and For Five. Tickets $15-$70. 8 p.m. Saturday, 2:30 p.m. Sunday, Texas Hall. BFA Art Exhibit The work of 43 Bachelor of Fine Arts candidates includes painting, drawing, sculpture, glass, printmaking, film/video, photography, digital imaging, and visual communication. Hours 10 a.m.-5 p.m. Mondays-Fridays, noon-5 p.m. Saturdays. Through May 16. The Gallery at UTA. Gallery 76102: Testament The exhibit is a collection of 12 photographs that explore the spiritual labor of bearing weight, submission, futility, and persistence. Gallery hours noon-6 p.m. Wednesdays-Saturdays. Through May 23. Free. Gallery 76102, Fort Worth Center. Planetarium The spring schedule features Dynamic Earth, Pink Floyd, Secret of the Cardboard Rocket, and Spacepark 360: Infinity. The summer schedule is May 26-Aug. 23 and includes Texas Stargazing; Stars of the Pharaohs; One World, One Sky; Cosmic Color; Dynamic Earth, Pink Floyd, Secret of the Cardboard Rocket, and Spacepark 360: Infinity. Planetarium. UTARI Seminar Samir Iqbal, associate professor of electrical engineering, discusses "Early Stage Cancer Diagnostics with Micro and Nanoscale Strategies." Free. Noon, boardroom, UTARI, 7300 Jack Newell Blvd. S., Fort Worth. UT Arlington Research Institute. U.S. Manufacturing Symposium The symposium is a Walmart initiative to create affordable, flexible, automated solutions to bring manufacturing back to the United States. See the schedule. Admission $35, $120 for exhibitors; 25 free passes for students. UTARI, 7300 Jack Newell Blvd. S., Fort Worth. UT Arlington Research Institute. UT Arlington shook off the offensive rust from Friday’s doubleheader, recording 16 hits on its way to a 9-3 series-clinching win Saturday over Appalachian State at Clay Gould Ballpark. The Mavericks honored eight seniors prior to the game and received key contributions from the three seniors in the starting lineup. Levi Scott went 3-for-5 with two runs and an RBI. Eric Tate was 2-for-4 with a pair of RBIs, while Travis Sibley went 2-for-5 and scored a run. In Friday’s doubleheader, UTA won the first game 2-1 and lost the second game 5-2. The team is 22-28 overall and 13-14 in the Sun Belt Conference. The Mavericks conclude the regular season with a three-game series beginning Thursday, May 14, at Texas State. A record-breaking campaign came to a close last Wednesday as the Mavericks dropped a 6-1 decision to Louisiana-Monroe in the Sun Belt Conference Championship first round in San Marcos. UTA finished the season with a 27-28 overall record, the team's highest win total in Kristie Fox's three years as coach. The Mavericks set single-season team records in batting average, runs, RBIs, hits, and walks. Seniors Nina Villanueva and Meagan Michele marked the end of their UTA careers. Villanueva leaves the program with the second-best career batting average at .363.